Wikipedia tells me Super Bowl Sunday is the second-largest day for U.S. food consumption, after Thanksgiving Day. Bet that got your attention foodies (George Clooney helped too)! Football is one of the world's most ancient games, but American Football only dates to the 1890s, popularized in high schools and colleges as well as on the professional field. The sport took center stage in 1967 when the Super Bowl was born. On January 12, 1969 when the Baltimore Colts were beaten by the New York Jets of the fledgling American Football League the audience exploded. The next year, the leagues merged, and over the next 40 years the Super Bowl has become America's most watched sporting event –– it's become a gathering of friends and family nearly as essential as Thanksgiving dinner or the 4th of July barbecue. "Following Apple Computer's 1984 commercial introducing the Macintosh computer, directed by Ridley Scott, the broadcast of the Super Bowl became the premier showcase for high concept or simply extravagantly expensive commercials. Famous commercial campaigns include the Budweiser "Bud Bowl" campaign, and the 1999 and 2000 dot-com ads. Prices have increased each year, with advertisers paying as much as $3 million for a 30-second spot during Super Bowl XLIII in 2009. A segment of the audience tunes in to the Super Bowl solely to watch the creative commercials. I used to host a Super Bowl party for couples. I lived in a loft that was long and narrow at that time. The men were at one end with their favorite foods and beer, and the girls were at the other watching a chick flick and eating a lot of chocolate and fancy finger foods with wine and champagne. Everyone brought favorite dishes and shared. I give you one of mine… for the boys in the front room. Go football! Season beef with spices and salt and add chopped onion. Roll into balls. Roll in flour and fry in oil till just brown. 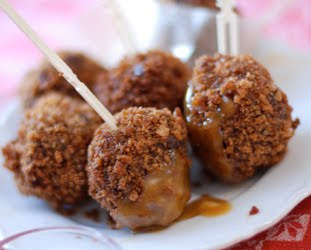 Roll the already fried balls in blended egg and water then roll in combined panko and pecans and fry until golden and crispy. Drain on paper towels. Serve hot or room temp for an appetizer with the dip. Boil first 4 ingredients gently till reduced to 1/4 cup, then add 5 spice. Cool. Add egg to processor, then mustard and process for 30 seconds. Add oil gradually to make a mayonnaise. Add the reduced sauce and salt and pepper to taste. This sauce is also good for cold roast beef, chicken fingers even shrimp! It’s a great sauce –– I often make double to have a little extra! I’ve had this recipe for years and years so I’m sorry I can’t give credit where credit is due –– and it is due! ** Thanks to Wikipedia for all the Football info! Ah yes, there is a lot of devil in the sauce! Love the sage and thyme flavors in the meatballs, Deana! I'd like to taste the Jasmine Absolute and Rose so think I'll go for a vodka martini! That sauce sounds positively diabolical, mmm. Is this Sunday the Superbowl? I actually didn't know ... let's just say no one, boy or girl, in my house watches football. Yay! But we sure do eat!!!! It's not quite the same game here in France, but it's the same way of living, men in front of the TV, and the girls in the kitchen ! I love particulary your devil sauce !!! Awesome giveaway! I would love to try the rose flavor in a delicate tea cake. Yum! Those meatballs sound killer....I will be trying those for sure! The devil sauce..and the pecans in the if you want more category.. sound great! I would be with the girls, of course, drinking bubbly and canapes, but would have to visit the boys once or twice for those delicious meatballs and devils sauce :-). Lots of interesting information. And yhose meatballs and dip are making me hungry; great post. I plan on using the essences to make marshmallows and middle eastern pastry. My Arabic professor liked the rose marshmallows I made last time. Barbara> A Rose martini is a great idea! Trix> Chocolate Souffle with rose? MMMMmmm. Chapot>Some things are the same on all the continents! Devil's own is good for both sexes! Linda> Pavlova is a favorite... roses anad raspberries are killer! Table de NAna> Devil's Own and Clooney would be great anywhere! Kathy>We did drop in on the boys and steal some goodies... they stayed out of the back thought! Lorraine> The name started years ago and stuck... it made people laugh and they didn't expect the heat! Zurin> You will like the dip... if you want to cheat you can put the reduction in mayo...think I'll put that in! Sage> Thanks for stopping by! Ju>Yeah, I don't know if CLooney would appreciate being associated with a meatball, but his film was the closest I got to watching a lot of the game ( I watch for the commercials!). Maier> Thanks for stopping by... middle eastern cuisine and roses go way back... rose marshmallows are a great idea!!! I love the Superbowl for the same reason I love Thanksgiving! But, we are in London which means the game starts at 11:30 and NO commercials. They have British commentary on the game explaining everything that has just happened instead. So this year is just going to have to be all about the food and last year nobody made till the end of the game (boys included). That dip sounds delicious - I'm a sucker for anything with sesame oil. Woah, this is some serious snack!! 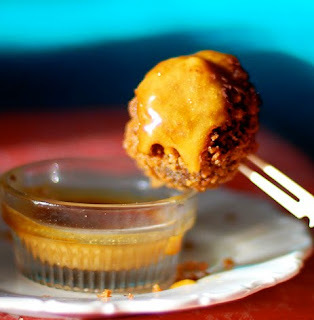 Twice-fried meatballs in dipping sauce? Wow. I have to bookmark this one. I love dippin kinda dishes. THis looks yummy. What a neat recipe! I love hot chocolate. LOVE LOVE LOVE it. I could drink it five times a day. But I do live in MN where it is cold for 6-8 months a year! Faith> Yup, until M*A*S*H* it was the Fugitive in 1967 that held the record. And yes, the parties were always a blast and since it was NYC no one had to worry about driving home! Xinex> that is so cool about your daughter! WOw! Memoria> they are evil... enjoy! Lori> Dippin dish it is! Amanda> If it's cold so often... you can drink hot chocolate so much longer! I so love your blog. I would have loved to be part of the couples' super bowl too hanging out with the girls why the boys watched the game. Although, I’d be running back to the TV to watch commercials. Although, I’d be running back to the TV to watch the commercials. I remember in college I'd have to analyze the commercials every year for my media classes. I still like the commercials. They bring back good memories of hanging out in a pizza parlor watching the game and drinking beer. I might be too late for the giveaway, but if I had either of those oils I would make beautiful shortbreads with them! Hi and it's so nice to meet you! Oh, those meat balls and sauce look and sound so delish! I'll have to try this. Thank you so much for popping in to see me. No, I have to admit none of the pinkness belongs to me!! I just went pink crazy on the internet. Cooking photographer> They aren't doing the clydesdales this year so I am going to protest! I am no sports person... now with all the great media coverage I can see the commercials next day without watching the game.. how great is that. SHortbread sounds nummy! Bentobaker>they would make a good April Fool's joke.. unless you were vegetarian! Sheila> The meatballs are addictive and totally fattening.. but isn't that what the Super Bowl is all about! Becky> They would get soggy in the bath../ with the nuts and the panko they stay crispy forever! Sippity Sup>Yup... skip the game... pig out on meatballs. Wow, I was so impressed by the delicious recipe for the meatballs, I have never made them with a dip before, and then I saw the giveaway. I am embarrassed to say I haven't heard about the absolutes before, they look and sound amazing, you could flavour your own water and have it in a beautiful glass bottle! I ove those meatballs.....and if I won the Jasmine Absolute, I would make a sauce to go with Kalfs liver.....on toast. And with the rose, I would make some fragrant Lokum aka Turkish delight! Hee...hee, George looks like he has meatballs stuffed up his sweater as shoulder pads...or is that just his muscles! Do you know since reading you post on ambergist I have been scowering the beach every day, I thought I had found some the other day and got very excited! It was only surf wax covered in black sand! How funny - a football history! The dip looks yum, i will have to bookmark it. French Bear> Thanks for joining me! Flavored water sounds lovely and meatballs with dip are a rare treat... go for it! Bunky cooks>Bring them as a present... or just make them for yourself! I always wrestle with those little square photos!!!! I think in 1.85:1 aspect ratio!! Kitchen Butterfly: Turkish delight is cool stuff...great idea! Peasepudding> I love that! As for beach combing, a couple in Australia found 15KG lump that was worth $300 grand not too long ago... keep looking!! If you find it take it to the nice Ambergris Co. NZ!! Megan> the dip is great... I often add more mustard to make it even more devilish!!! Our blog is so cool. Thanks for visiting my blog too! Sorry I meant YOUR BLOG!!! Lol, I have to wonder why I shudder a little when I see Devil in the name of a recipe, when I eat Devil's Food Cake all the time. Ha ha ha. Great meat balls - I reckon I'd finish them all in one sitting! I will have to give these a try for Sunday! The dip for the meatballs sounds fantastic! Jennifer>Thanks for the visit... the dip is really good. Flourchild> that was a good one... just like something I would do! Peabody> Thanks for stopping by... meatballs are good any ol day!! 5 Star Foodie> you will like it, honest! I don't do football, but I'll definitely do the meatballs and dip. (We can have them during a hockey game.) They look outrageous. I really like coming here. Your blog is different and very refreshing. N.
Between George Clooney, meatballs and the devilish dip...well, I completely lost my train of thought. So I'll have to skip the giveaway. But, I want to add that I've enjoyed reading your very lovely blog! ... to imagine what i would make with rose absolute. Ah... wild rose oil given on birthdays with a wild rose tour in the wilds of BC, infusing in the blooms. A tasting plate of abalone with rose absolute buerre blance glazed dandalion, seared Qualicum Bay scallops with rose infused roasted wild walnut, BC white spot prawn dumplings with rose infused glazed wild onions, and rose absolute angel food cake with wild strawberry sabayon. What a lovely blog! I'm so glad to have found it and I'm definitely saving this recipe. The devil's own dip sounds fabulous. Mags> it's good and only evil if you make it too often... I always add a little extra mustard... but then I love things hot!!! Dip sound is good and interesting information. Thanks for the share.